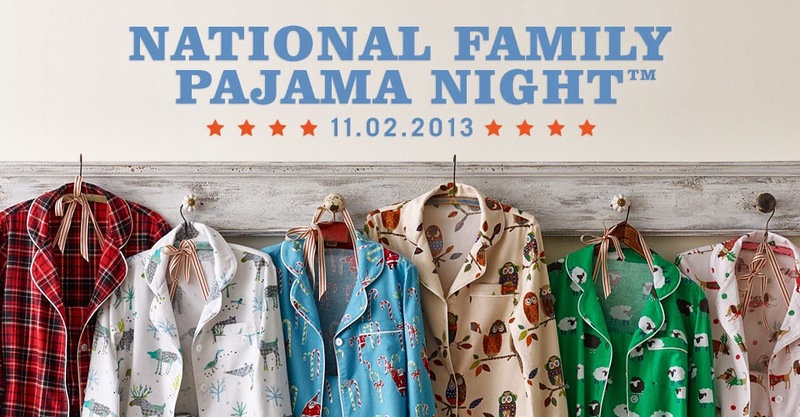 Hines-Sight Blog: The Company Store "National Family Pajama Night" Giveaway to Support Ronald McDonald Houses in the U.S. The Company Store "National Family Pajama Night" Giveaway to Support Ronald McDonald Houses in the U.S. I am excited to partner with one of my favorite stores to give you the opportunity to win cozy pajamas for your family (up to six pairs of pajamas for two winners) to celebrate the 3rd annual National Family Pajama Night™ on Saturday, November 2, 2013. As in years past, families staying at Ronald McDonald Houses, a “home-away-from-home,” across the U.S. will gather in The Company Store PJs for a night to remember. The Company Store will be donating 3,000 pairs of pajamas to RMHC guest families caring for a sick child. In addition, The Company Store will donate $1 to RMHC for every pair of pajamas purchased from October 2 through to December 2, 2013. This year, a record-setting 54 Ronald McDonald Houses across the country will be participating. Family pajamas are available in an array of six different holiday-themed styles, including The Company Store’s most popular “Woodbridge Plaid” and “Winter Forest” family pajama lines. Sizes are offered for the entire family, including the family dog. To participate, visit The Company Store’s National Family Pajama Night™ website to purchase pajamas and support care for RMHC children and their families. I chose the Night Watch Family Pajamas for the Hines. I love all the patterns, but my daughter has a special fondness for owls. We'll see you in your pajamas for a good cause on November 2. Winners for this giveaway will be drawn at random on Thursday, October 24. The Company Store and Company Kids are renowned for providing 100 years of quality, comfort and care through the best US-crafted comforters, fashion bedding, home décor, and apparel for adults and children. Six-generation experts in comfort, The Company Store produces its signature LaCrosse down comforters in LaCrosse, WI, while sourcing the latest trends and styles from around the world. The Company Store and CompanyKids offer comfort and style at every price point for the quality-minded consumer. To learn more, visit www.thecompanystore.com. This giveaway will end at 12 a.m. on October 24. Two winners will be selected. Rafflecopter will be managing entries. 1. Click on "Use Your E-mail" or "Sign in with Facebook"
2. A box will pop up. Enter your name. Enter your e-mail address or Facebook ID. 3. Click on "Log In". 4. A box will pop up with choices to enter. Put your mouse on the +1 button. Click it. 5. Hit "Enter" and your e-mail address should be in the system, and you will have one entry. You will have several ways to earn entries. Disclosure: The Company Store is sponsoring this giveaway. I also received pajamas for my family. The Company Store is a favorite store of mine, and no other compensation was provided for this post.